Background: Depression is a serious and frequent co-morbid illness among people with epilepsy (PWE) and the risk for depression in PWE is higher than the general population. However, depression among PWE is often under diagnosed and treated by physicians other than psychiatrists in resource-limited settings like Ethiopia. Objective: This study aimed at assessing the prevalence and factors associated with depression and its implication for treatment among PWE in Southwest Ethiopia. Materials and Methods: A hospital-based cross-sectional study design was facilitated among 300 adult subjects diagnosed with epilepsy at the Jimma University Specialized Hospital (JUSH) from August to October 2012. 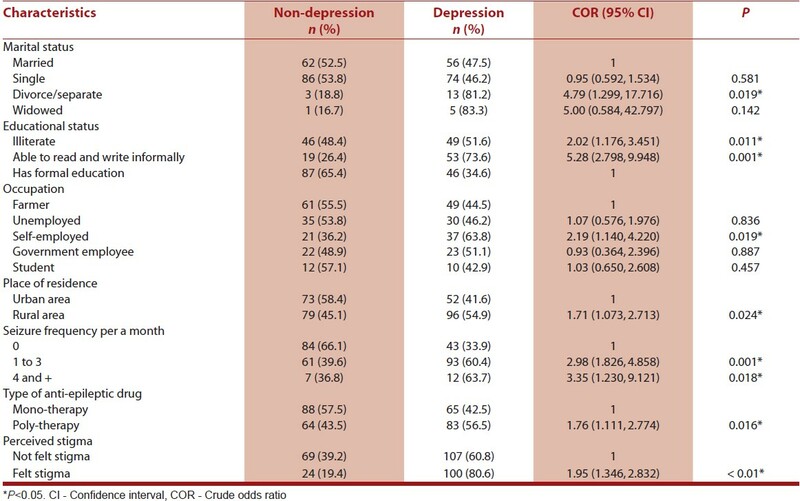 Depression was assessed using the Beck Depression Inventory-II (BDI-II) scale which was found to have Cronbach's Alpha of 0.82 for this study. Results: A total of 300 adult subjects with epilepsy were interviewed making a response rate of 100%. The prevalence of depressive disorder among patient with epilepsy was 49.3%. Of these, 39.9%, 38.5%, and 21.6% of the patient were found to have mild, moderate, and severe depression, respectively. Epilepsy-related perceived stigma, high seizure frequency, and low educational status were found to be independent predictors of depression among subjects with epilepsy. Conclusion: In this study, depression was found to be highly prevalent. Early recognition and treatment of depression through routine screening and assessment of PWE should become an essential part of diagnosis and treatment protocol. In spite of high prevalence of depression among PWE, depression is often under diagnosed and untreated in a resource-limited setting like Ethiopia. This study is aimed at assessing the prevalence and factors associated with depression among PWE and the implications for treatment. A cross-sectional study design was facilitated at the Jimma University Specialized Hospital (JUSH) seizure clinic from August to October 2012. Geographically, JUSH is located in Jimma town, 350 km southwest of Addis Ababa, the capital city of Ethiopia. Currently, JUSH is the only teaching and referral hospital located in the southwest Ethiopia for a population of more than 10 million inhabitants. The study population constituted of adult patients with epilepsy receiving treatment. Those seriously ill patients (who were in a comatose state and those unable to communicate) and those with a substance-abuse disorder were excluded from the study. The sample size was determined using a single population proportion formula by assuming the proportion of subjects with a depressive disorder among PWE to be 0.45 based on research done in Nigeria. [ 15] Other assumptions made during the sample size calculation were 5% margin of error (d) and level of 95% confidence interval (CI). Based on these assumptions, the sample size was calculated with a correction formula and 5% non-response rate providing the desired sample size of 300 PWE . Since the sampling frame of the study participants was not known, systematic random sampling methodology was used, by a predetermined sampling interval (K) as K = N/n = 4. The first patient was selected randomly by a lottery method among those patients who came to the clinic on a first come, first serve basis and then the sampling method continued by selecting every fourth patient until the desired sample size was obtained. Whenever patient was found to be ineligible, the next patient was selected. The data-abstracting format was designed to collect data on the type of seizure diagnosis, number of medications used as well as treatment and illness duration. The initial questionnaire was translated from English to the local languages, Afan-oromo and Amharic. Data collected through a face-to-face interview by a trained BSc clinical nurse supervised by a trained MSc-level professional and the principal investigator. To ensure data integrity, the supervisor checked the process of data collection by spot-random checking of the questionnaire to ensure completeness, accuracy and consistency on a daily basis. Data was double-entered in to the Epi-data version 3.1 for double entry verification and exported in to the statistical package of social sciences (SPSS) version 16 to be cleaned and analyzed. The data was then analyzed to generate descriptive statistics: Means, frequency, percentages, and standard deviations. A logistic regression analysis was computed to generate adjusted odds ratio (AOR) to identify independent predictors adjusted for confounding variables with a 95% CI. Ethical clearance was approved by the Ethical Review Board of Jimma University, College of Public Health and Medical Sciences. Written informed consent was obtained from every study subject. There was no risk of danger or hazard for the study subjects. Those subjects found to have moderate to severe depression were referred to the psychiatric clinic for early treatment. A total of 300 subjects participated providing a response rate of 100%. Of the total subjects 183 (61%) were males. The mean age was 27.4 (±9.8) years. One hundred and seventy five (58.3%) were from rural area, 53.3% were un-married, 31.7% were illiterate, 21.7% were unemployed, and 81.7% were living with their family. The average annual income was < 706 United States dollar (USD) in 92% of the subjects [Table 1]. 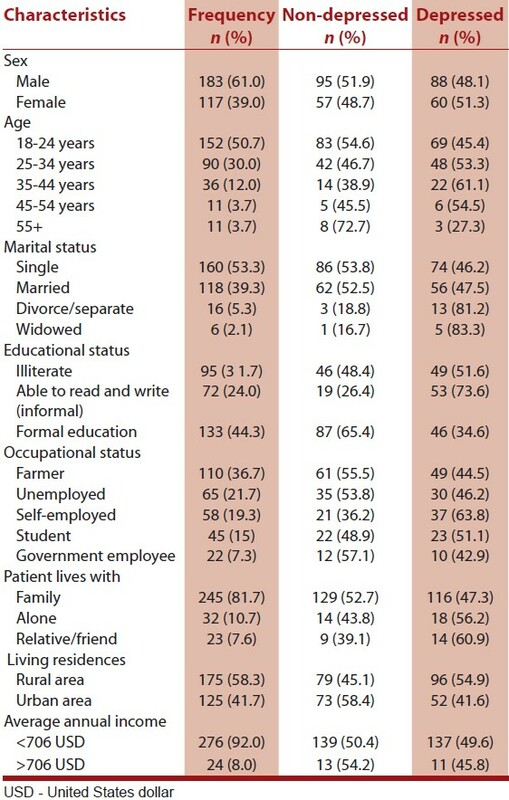 Of the 300 study subjects, 62 (20.7%) subjects had a family history of mental illness. In 51.3% of the subjects, seizure frequency was 1-3 times per month and no subject was seizure-free at the time of the study. The duration of the illness was between 1 and 5 years in 121 (40.3%) of the subjects, while nearly one-third of the subjects had an illness duration between 6 and 10 years. Seizure type was general tonic clonic seizures (GTCS) in 71% of subjects. Of the 300 subjects, 51% of the subjects were on single antiepileptic drug (AED), while the rest were on polytherapy. With regards to medication adherence, 49 (16.3%) were irregular in their drug adherence. The most common reasons cited for non-adherence were forget to take drug (17.3%) and unwillingness to take drug in about a quarter of the subjects. On the other hand, 16 (5.3%) subjects stopped taking medication as they felt better, and 24 (8%) stopped drugs as there was worsening of epilepsy. Of the total study subjects, 123 (41%) subjects reported no emotional and/or financial support from close family members, 45.7% reported persistent fear of seizure recurrence, and 36.7% had physical injury or deformity associated with epilepsy. Because of the epilepsy, 124 (41.3%) subjects had perceived stigma related to epilepsy, of these subjects 97 (32.3%) felt that some people would prefer to avoid having social interaction, 79 (26.3%) felt that some people would prefer to avoid them from social related activities while 77 (25.7%) reported feeling that they were treated as being inferior [Figure 1]. Three hundred subjects completed the BDI-II, depression was present in 148 (49.3%) subjects: Mild in 59 (39.9%), moderate in 57 (38.5%), and severe in 32 (21.6%) subjects. Among different variables considered in this study, age, duration of illness, marital status, educational status, occupation, place of residence, seizure frequency, type of AEDs, and epilepsy-related perception of stigma were associated with depression at P-value < 0.2. In the bivariate logistic regression, the risk significant factors for depression were: Divorced/separated status, illiterate, minimal education (minimal reading and writing), self-employed, rural domicile, seizure frequency of 1-3 per month, seizure frequency of more than 4 per month, polytherapy, and epilepsy-related perceived stigma (P < 0.05) [Table 2]. In order to control for confounding factors and to identify the predictors for depression, a multivariate logistic regression model analysis was computed. For this final model, all variables with P < 0.2 in the bivariate analysis were taken as a candidate. A P < 0.05 was considered as statistically significant. Accordingly those who were illiterate had approximately two-fold likelihood to have depression as compared to those who had a formal education [AOR 1.98 (1.069, 3.674)]. Those who were able to minimally read and write had approximately six - fold likelihood to have depression as compared to those who had formal education [AOR 6.08 (3.000, 12.300)]. Those with seizure frequency of 1-3 per a month had approximately four-fold likelihood to have depression as compared to those patients who did not experience seizure every month [AOR 4.14 (2.301, 7.431)] and those who had epilepsy-related perceived stigma had approximately 4.6-fold likelihood to have depression compared to their counterparts [AOR 4.64 (2.607, 8.267)] [Table 3]. This is the first study of its kind in Ethiopia which attempted to explore the prevalence of depression and associated factors and its implication for treatment among PWE. The findings of this study could be taken as a baseline finding for other researchers in sub-Sahara African countries, and could help in understanding the current situation and reality in Ethiopia by comparing the finding from other similar studies conducted in many other countries. The prevalence of depression in this study was 49.3% among PWE. Among these subjects with depression the severity of depression was: Mild in 39.9%, moderate in 38.5%, and severe 21.6%. The observed prevalence of depression in this study is comparable to the findings from other studies in developed and developing countries, ,,, and four times higher as compared to a study in Canada. This wide variation could be related to: Socio-demographic difference in the study setting, hospital-based vs. community-based. Canadian study used different diagnostic tools in the Composite International Diagnostic Interview (CIDI). The findings of this study indicate that depression among female respondents was slightly higher (51.3%) as compared to male patients (48.1%). Similarly, females are at higher risk of depression due to many reasons including hormonal factors and socio-demographic disadvantages encountered by women living in the developing world like Ethiopia. Of the study subjects, subject in the age group of 35-44 years had a significantly higher rate (61.1%) of depression, as compared to other age-groups. Our findings revealed that subjects with perceived stigma related to epilepsy had 4.6-fold likelihood to have depression as compared to their counterparts. Similar were the observations in other studies. , Some studies also indicated that epilepsy is a highly stigmatized disease in many different cultures particularly in countries with limited resources. , In addition to this, health care providers often focus exclusively on medical aspects of the disorder, and as such, social disability, and the total burden of the disease might be often neglected. PWE may also encounter stigma because of the unpredictable and uncontrollable nature of seizures which could induce fear and concern for others. In this study, subjects who had a seizure frequency of 1-3 per a month had approximately a four-fold likelihood to have depression as compared to those who had no seizures in a month [AOR = 4.1; 95% CI: (2.301, 7.431)]. This finding is consistent with the findings in studies in Greece, Nigeria, Togo, and the UK. ,, This strong link between depression and seizure frequency might be due to unreliable medication adherence. Subjects with higher seizure frequency could develop depression because of fear of recurrent seizures. Educational status is an important factor associated with depression. Subjects who were illiterate had approximately twice the increased likelihood to have depression as compared to those who had a formal education, [AOR = 1.98; 95%CI: (1.069, 3.674). Those with a minimal education were approximately 6-fold likelihood to have depression as compared to those who had formal education, [(AOR = 6.07; 95%CI: (3.000, 12.300)]. This finding is in agreement with the findings in the studies in the US and the UK. , This finding, however, was in contrast with the study done in Canada. The discrepancy might be explained by the difference in the study settings, population characteristics and to the difference in socioeconomic statuses of the patients with epilepsy in Canada versus a developing country like Ethiopia. In general the prevalence of depression in this study was found to be higher among PWE. Some subjects may have been unaware of being depressed and did not receive inquiries from their physicians about their mood. Such situation usually results in under diagnosis and untreated cases of depression among a group of similar patients with epilepsy. This study has its own strengths and limitations. An identified strength of the study is that it is the first of its kind in Ethiopia. The researchers, however, did not use diagnostic evaluation to determine the diagnosis of epilepsy. Rather, subjects with a presumptive diagnosis of epilepsy were recruited from the epilepsy clinic. Internists have different diagnostic approaches and modalities to determine a final diagnosis of epilepsy including their own clinical expertise and the use of electroencephalography (EEG). Since, all the subjects were receiving antiepileptic medication; we were not able to see any association to their counterparts in the development of depression. Our study findings show that depression is highly prevalent co-morbid condition among PWE; however, none of them were screened or treated for depression. Epilepsy-related stigma, seizure frequency, and educational status were found to be independent predictors of depression. We would like to acknowledge Jimma University for financing this study and the study subjects for their kind co-operation. We also would like to acknowledge Jeffrey M. Robbins LICSW, a senior clinical social worker at Brigham and Women's Hospital, Department of Neurology, division of Cognitive and Behavioral Neurology; and a Teaching Associate at Harvard Medical School for his generous contribution to this paper. Prince M, Patel V, Saxena S, Maj M, Maselko J, Phillips MR, et al. No health without mental health. Lancet 2007;370:859-77. The world health report 2001-Mental health: New understanding, new hope. Bull World Health Organ 2001;79. Available from: http://www.scielosp.org/scielo.php?pid=S0042-96862001001100014 and script=sci_arttext. Diagnostic and statistical manual of mental disorders fourth edition (DSM IV). American psychiatric association: Psych.org/MainMenu/Research/DSMIV.aspx. Ustun TB, Ayuso-Mateos JL, Chatterji S, Mathers C, Murray CJ. Global burden of depressive disorders in the year 2000. Br J Psychiatry 2004;184:386-92. World Health Organization. Evidence, Information and Policy Geneva; 2000. Stein DJ, Seedat S, Herman A, Moomal H, Heeringa SG, Kessler RC, et al. Lifetime prevalence of psychiatric disorders in south Africa. Br J Psychiatry 2008;192:112-7. Abdulahi H, Mariam DH, Kebede D. Burden of disease in rural Ethiopia. Ethiop Med J 2001;39:271-81. Beyero T, Alem A, Kebede D, Shibire T, Desta M, Deyessa N. Mental disorders among the borana semi-nomadic community in southern Ethiopia. World Psychiatry 2004;3:110-4. World Health Organization (WHO) Atlas: Epilepsy care in the world. Geneva: 2005. Adamolekun B. The etiologies of epilepsy in tropical Africa. Trop Geogr Med 1995;47:115-7. Ojinnaka NC. Teachers′ perception of epilepsy in Nigeria: A community-based study. Seizure 2002;11:386-91. Reisinger EL, DiIorio C. Individual, seizure-related, and psychosocial predictors of depressive symptoms among people with epilepsy over six months. Epilepsy Behav 2009;15:196-201. Fuller-Thomson E, Brennenstuhl S. The association between depression and epilepsy in a nationally representative sample. Epilepsa 2009;50:1051-8. Grabowska-Grzyb A, Jedrzejczak J, Nagañska E, Fiszer U. Risk factors for depression in patients with epilepsy. Epilepsy Behav 2006;8:411-7. Ogunrin OA, Obiabo YO. Depressive symptoms in patients with epilepsy: Analysis of self- rating and physician′s assessment. Neurol India 2010;58:565-70. Kogeorgos J, Fonagy P, Scott DF. Psychiatric symptom patterns of chronic epileptics attending a neurological clinic: A controlled investigation. Br J Psychiatry 1982;140:236-43. Standage KF, Fenton GW. Psychiatric symptom profiles of patients with epilepsy: A controlled investigation. Psychol Med 1975;5:152-60. Ettinger A, Reed M, Cramer J. Epilepsy Impact Project Group. Depression and co-morbidity in community-based patients with epilepsy or asthma. Neurology 2004;63:1008-14. Barry JJ, Huynh N, Lembke A. Depression in individuals with epilepsy. Curr Treat Options Neurol 2000;2:571-85. Khalid H, Mohammad T. Depression amongst Epileptic Patients. Combined military hospital pano aqil. Professional Med J 2005;12:317-21. Shehata GA, Bateh Ael-A. Cognitive function, mood, behavioral aspects and personality traits of adult males with idiopathic epilepsy. Epilepsy Behav 2009;14:121-4. Beghi E, Roncolato M, Visona G. Depression and altered quality of life in women with epilepsy of childbearing age. Epilepsia 2004;45:64-70. Nidhinandana S, Chinvarun Y, Sithinamsuwan P, Udommongkol C, Suwantamee J, Wongmek W, et al. 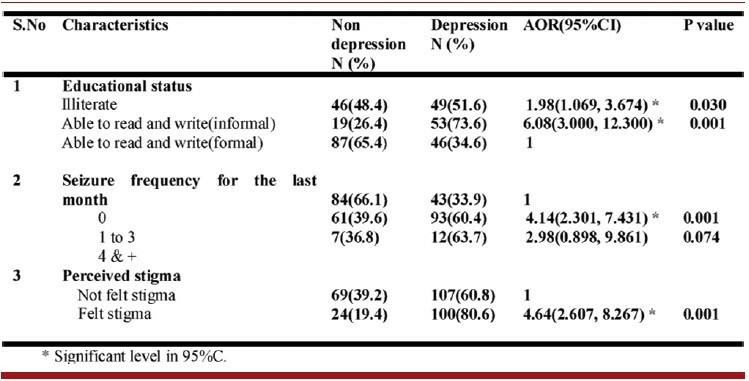 Prevalence of depression among patients with epilepsy at Phramongkutklao Hospital. J Med Assoc Thai 2007;90:32-6. Mensah SA, Beavis JM, Thapar AK, Kerr M. The presence and clinical implications of depression in a community population of adults with epilepsy. Epilepsy Behav 2006;8:213-9. Kimiskidis VK, Triantafyllou NI, Kararizou E, Gatzonis SS, Fountoulakis KN, Siatouni A, et al. Depression and anxiety in epilepsy: The association with demographic and seizure related variables. Ann Gen Psychiatry 2007;6:28. Nubukpo P, Preux PM, Houinato D, Radji A, Grunitzky EK, Avodé G, et al. Psychosocial issues in people with epilepsy in Togo and Benin (West Africa) I Anxiety and depression measured using Goldberg′s scale. Epilepsy Behav 2004;5:722-7. Publisher′swebsite. Available from: http://www.harcourtassessment.com [Last accessed on 2015 Jan 06]. Morisky DE, Green LW, Levine DM. Concurrent and predictive validity of self- reported measures of medication adherence. Med Care 1986;24:67-74. Rigby D. Adherence assessment tools: Drugs don′t work when they′re not taken. The Aust J Pharma 2007;88:32-3. Jacoby A, Baker G, Smith D, Dewey M, Chadwick D. Measuring the impact of epilepsy: The development of a novel scale. Epilepsy Res 1993;16:83-8. Jacoby A, Snape D, Baker GA. Epilepsy and social identity: The stigma of a chronic neurological disorder. Lancet Neurol 2005;4:171-8. Ismail H, Wright J, Rhodes P, Small N, Jacoby A. South Asians and epilepsy: Exploring health experiences, needs and beliefs of communities in the north of England. Seizure 2005;14:497-503. Thapar A, Roland M, Harold G. Do depression symptoms predict seizure frequency-or vice versa? J Psychosom Res 2005;59:269-74. World Bank. Country and lending groups 2009; (internet accessed) Available from: http://www.data.worldbank.org/about/countryclasifications [Last accessed on 2012 Apr 22].